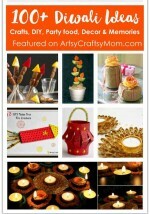 Recreate your Childhood Diwali Memories with these colorful Rangoli Inspired Diwali Cards that you can Make at Home! Diwali is synonymous with diyas and brightly colored rangolis. I have fond memories of creating beautiful rangoli mandalas with my cousins at Diwali. This year I decided to re-create the magic of rangolis, not in the traditional way, but on paper. I love playing with beautiful, bright colors. Pick 3-4 colors of your choice to create an ink blended background. I used Distress Oxide Inks to create my background because they are very easy to blend, you can use Distress inks or any other pigment or dye-based inks. Starting with one color, begin by applying the color with a sponge applicator in a circular motion. Move on to the next color and apply in the same manner, overlapping colors a bit and making sure they blend. Once you’ve covered the entire panel, go over the colors again to create an evenly blended look. Sprinkle some water on the panel and dab with a tissue to create some texture. Once the ink has completely dried, stamp on the mandala with Versamark Watermark ink or gold pigment ink. Heat emboss with gold embossing powder. Highlight portions of the mandala by adding some color with a brush. I added die-cut ‘Happy Diwali’ sentiment and mounted the finished background panel with double-sided foam tape on matching cardstock. I tried a few different color combinations and loved the results. 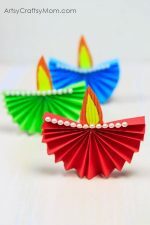 We also made a couple of Diwali cards with diyas on them, after all, what is Diwali without diyas! These were made by my five-year-old with a little help from me. All the colors were her choice; I would have never put pink glitter in the diya’s flame! But I do like how they turned out! 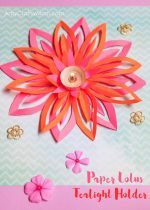 Diya Stencil. You could also make your own by printing a diva and cutting it out with a craft knife. Pigment or dye inks in at least two colors, we used Distress Oxide Inks. Position the diya stencil on white cardstock with washi tape. Mask out everything other than the bottom of the diya. Sponge the diya with the color of your choice. Now, mask out the diya bottom and sponge the flame of the diya. 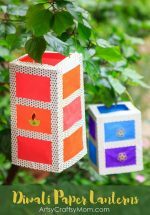 Trace out the shape of the flame using the stencil on a piece of washi tape and cut out. Use this to mask out the flame, mask the rest of the diya too. Place the circle stencil around the flame and sponge with yellow color. Peel off all the washi tape to reveal the diya. Apply liquid glue and add glitter. Let it dry. 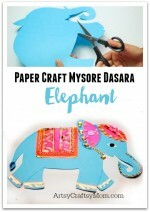 Cut the white cardstock panel with the diya to the desired size and mount on coordinating cardstock. Where did you purchase your mandala stamp? It’s beautiful! I LOVE your cards; so inpsirational!